Ibanez EDB600 Ergodyne 4-String FRETLESS Bass Gun Metal and Fender Rumble 15 Bass Amp. Well loved, and in great shape. What makes this one so cool is that this one is fretless! It is SO fun to play, and sounds beautiful!It is nearly impossible to find these fretless. This is a rare find. Comes with a guitar stand, and strap. 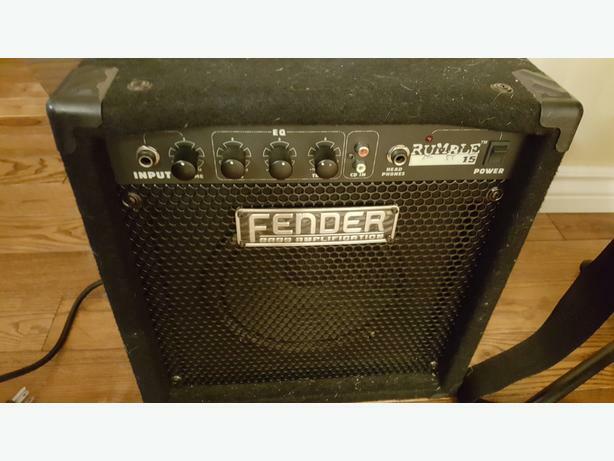 The 38 Watt Fender Amp is great for practicing, or in small jam spaces. Like new. Comes with a patch cord. Cross posted, first come, first serve. Text Chris at the # provided.